Most of the Catholic population of Ireland before the mid 1800s was illiterate. Children who lived in a town had a greater chance of learning to read and write than children who lived in a rural setting. The Walshes and Langans who reported the births in the family to the civil authorities fell into this category. On all of the civil registrations for the births of her children, Fanny Walsh's name was listed under the heading "Signature, Qualification and Resident of Informant" as "Fanny her x mark Walsh". The "x" was obviously not made by Fanny, but by the clerk. It should be pointed out that many men and most women, the world over were illiterate during the years of the births of Fanny's children. 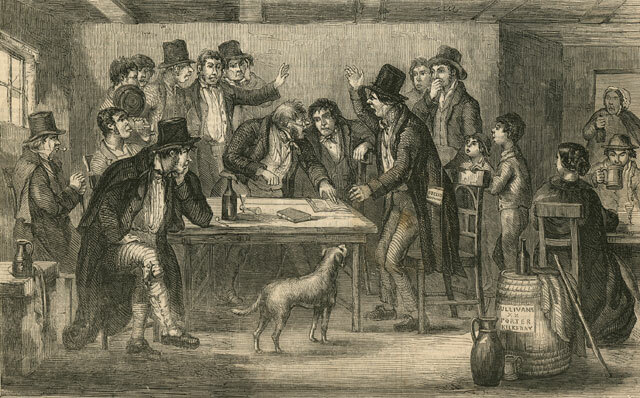 The births of the children of Nappy and Mathias Langan were reported by their mother, their father, or Pat Langan (who was listed as "present at the birth"). Nappy was listed as "Nappy her x mark Langan". The "x" was clearly made by the clerk and not by Nappy. Mathias was listed as" Mathias his x mark Langan". The "x" was made by the clerk. Pat Langan who listed his "Qualification" as "present at the birth" reported the birth of Margaret Langan, the daughter of Mathias and Nappy Langan, in 1875. Pat was listed under "Signatures, Qualifications and Residence Information as "Patrick Langan X His Mark". The "X" in this case was not the neat "X" made in almost every entry by the clerk but clearly an "X" made by Patrick himself. Patrick also recorded the birth of James in 1877, but did not "make his mark" at that entry. The designation "present at the birth" was common but not overly so. Most births were reported by a mother or father. I have tried to determine a meaning for this phrase other than the obvious one. It seems unlikely that Pat Langan would not have just come by for the birth. I feel that it is more reasonable that Pat was living in the same household with Mathias and Penelope. The 1901 census in both the town of Ballinrobe and the village of of Mochara show that the majority of people over fifty could not read or write. There was also a sprinkling of people, both male and female, between 20 and 50 who could not read or write. The Lardner brothers, James, age 80, and Michael, age 68, stonecutters. However, another member of the Lardner family, John, age 40, mason, could read and write. Richard O'Donell, age 55, chimney sweep, the husband of Ellen Walsh. Bridget Feerick, the sister of Mathias Langan, age 60, washwomen, Ballinrobe. Martin Farragher, the sponsor of several of the Langan children, age 80, farmer, Ballinrobe. Thomas Byrne, the brother of Penelope Byrne, age 55, farmer, Mochara. Peter Byrne, age 70, farmer, Mochara. Birdie Mulloy, a Ballinrobe historian, notes that very few people who "emigrated" before the Roxboro Christian Brother's Schools was opened in Ballinrobe in 1876 had any education. The Christian Brothers in Ireland were a group of teachers whose schools for the lower and middle classes were ahead of others in efficiency and popularity. Things changed for the children of John and Fanny Walsh and Mathias and Nappy Langan. The ship manifest which recorded the immigration of Joseph Walsh and his sister, Fanny Walsh, indicates they were both able to read and write. In response to the literacy questions on all the US censuses Joseph Walsh and Maggie Langan Walsh indicated that they were able to read and write. Being male, living in town, and having been born three years before the school was founded, Joseph Walsh most likely went the newly formed Christian Brother's School. The following signatures for Joseph all come from papers related to his citizenship. Noël Browne spent several years in Ballinrobe and recounts his memories of his time there in his autobiography Against the Tide. Born in 1915 he was a doctor and politician whose parents died of tuberculosis when he was still very young. His father died in 1925 and the widow Browne, who was born in Hollymount, returned to Ballinrobe where she hoped to be able to raise her children with the help of her family. Unfortunately, all of the members of her immediate family had emigrated to America and the local population was not as supportive as she would have hoped. There were five children at home under twelve years of age and after a short period of time they became the caregivers of their mother who would die of TB in 1927. Before her death, however, she sent her youngest daughter, age 9, to the United States to be raised by a relative and moved the rest of the children to London where her oldest daughter, Ellen, lived. The family lived on Church Lane in Ballinrobe for about two years. They carried all their water from the Robe River. Noël went to the local Christian Brother's school. "They certainly taught us with great diligence, and with some effect, but for the most part the were enthusiastic religious zealots, whose sole purpose was to win young Irish boys and girls to Roman Catholicism in a united Ireland. They did not see any contradiction in fighting fiercely and winning partial sovereignty from the English while still proclaiming total subservience on all issues of serious social or political importance to a different faraway ruler in Rome." Hatred of the English and Protestantism for past transgressions was instilled in the students by the Christian Brothers. "There was no Gregorian chant in Ballinrobe. The general ethos was a powerful sense of angry nationalism and the demand that in all of us there must be inculcated a self-sacrificing patriotism. Singing classes were occupied with emotive patriotic songs mixed with the sweet laments for Ireland's wrongs. A militant republicanism replaced the bland Free State ambience of Athlone. We knew and admired men 'on the run'; unconsciously we braced ourselves for future sacrifice and struggle, probably even prison or death 'for Ireland's freedom'. We played exclusively Gaelic games." "were even more impoverished that ourselves, dressed in ragged misfitting clothes. They walked long distances bare-footed to school, with their hair uncombed and laden with lice, unwashed and dirty. Their teeth were rotten, their skin pockmarked with flea bites. In spite of the fact that here was the true repository of the cherished native language, they were not favored by our militant national Christian Brothers but treated with contempt as members of a lower order as the British had once treated all of us native Irish." 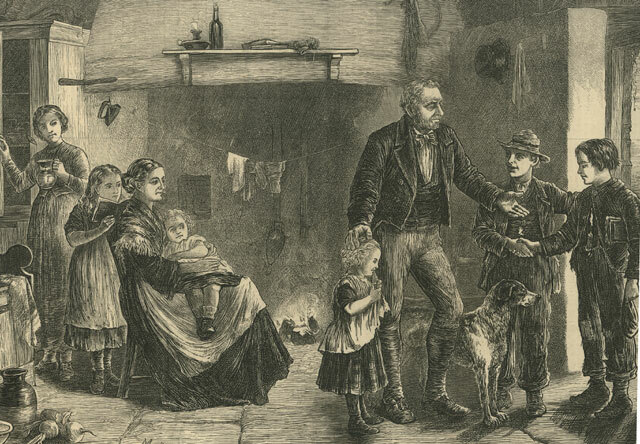 The Gaeltacht students were not show any special consideration because of their lack of knowledge of English and were often singled out for "cruelly unbridled beatings which constituted Christian Brother discipline". The penal laws stated that "no person of the popish religion shall publicly or in private houses teach school, or instruct youth in learning within this realm..."
There were schools in Ireland open to Roman Catholics but the Roman Catholic population refused to support them because they proselytized both the Church of Ireland and Anglicization. An alternative for a Catholic and Irish education was found in the Hedge Schools which were held in secret, often in barns, caves or behind the hedges. These "schools" taught Irish history, tradition, music, and folk tales. Some also included classical training in Latin and Greek. While the majority of children received no schooling the children who did were mainly in Hedge Schools. The hedge school teacher was greatly respected by the parents and was a welcome guest in their homes where he got the best bit to eat and the warmest corner to sit in. The penal laws were gradually lifted and by the 1830s there were enough acceptable schools that the Hedge Schools died out. 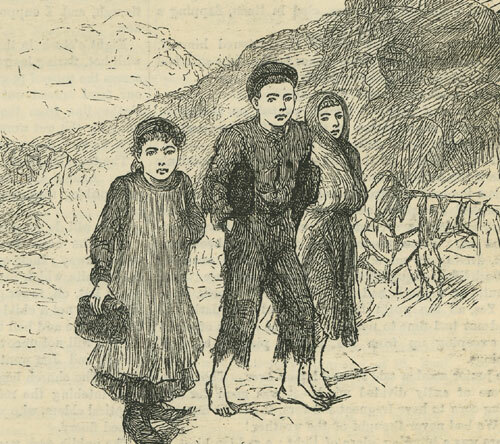 These schoolchildren are carrying blocks of turf to heat the schoolroom. Notice that two of them are shoeless despite what appears to be cold weather. Before the establishment of the National Education System poor boys of intellectual promise in an area without a school would go to another county were there was a good teacher. The boy would travel with a certificate from the parish priest ascertaining his religious and moral character. He was taught gratis and offered free lodging at the home of some better off local family. Having received an education far better than he would have in his own parish the young man would often return to his home district and become the local teacher. The illustration depicts a scene belonging to the pervious generation. By 1872 there were reasonable good schools all over Ireland. 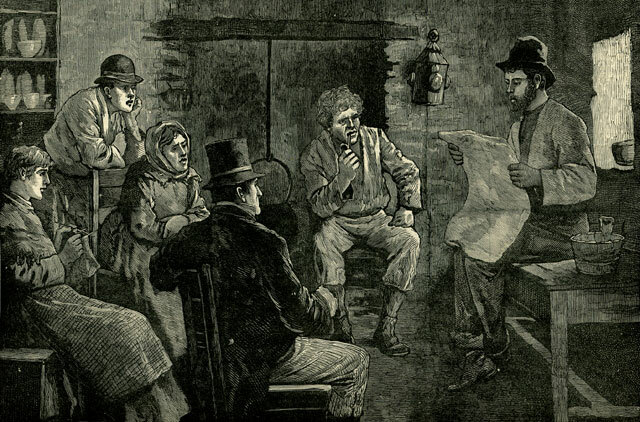 "Discussing The New Irish Land Act"
Those who could read, read to others who could not. There were people who could read but not not write, like a widow in Kildare and her three children. See Cottage Interiors near the bottom of the page. 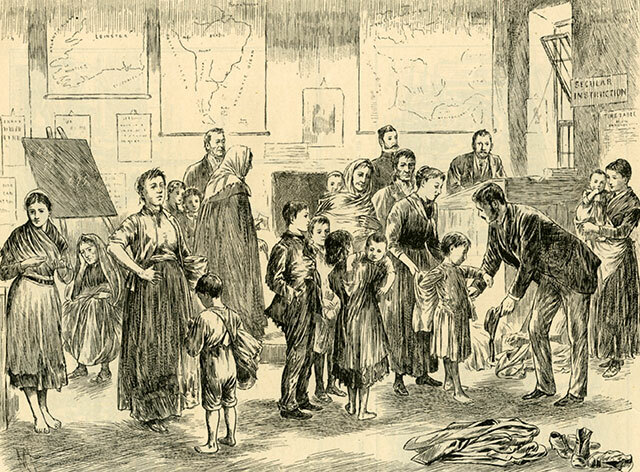 The Illustrated London News, May 9, 1891 Clothing Poor Children In A West Ireland Schoolhouse. Signs on the walls are SECULAR INSTRUCTION and TIMETABLE. Maps are of: the south west of Ireland, South America and France.